Loving books: [Daph's BBE] Character Interview with Zira from Daughter of the Flames & Giveaway! [Daph's BBE] Character Interview with Zira from Daughter of the Flames & Giveaway! 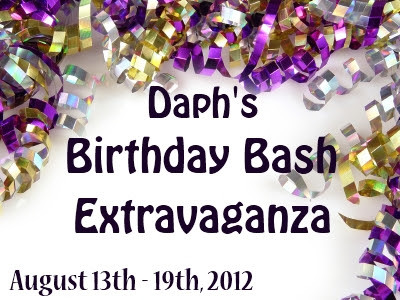 It's the first day of my Birthday Bash Extravaganza, with which I celebrate my birthday on the 17th! 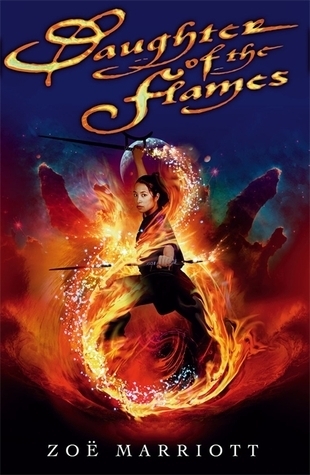 We're kicking off with a character interview with Zira from Daughter of the Flames by Zoë Marriott. Zira is the main character in the first book in the Ruan series, a feisty girl who knows how to handle herself, and I'm very excited that she was able to make some time to stop by! Hi Zira, it’s lovely meeting you! How are you today? Should I bow? *Looks worried* No, I don't think... no. If we were being formal, you should probably address me as Reia. But I'm still not entirely used to that, so let us just be comfortable instead. It's very nice to meet you too. You’ve gone through a pretty hectic time, trying to protect the people of Ruan. How did you experience this? Did it feel natural to you? In some ways it did. I always intended to fight for my people. To protect those who could not protect themselves. I always intended to be a warrior. I think that is what I have done, what I have become. But I thought I would be following a better leader's orders. I thought that I would be a small part of a larger, greater force. Instead I have become the leader myself, and I have had to make decisions... choices that would affect not just me, or even the ones I care for, but everyone. I have had fight for the right to make those decisions - not just accept leadership, but seize it from those who would have defied me. That has been difficult. There were times when I questioned my right, even my fitness, to rule... it has been a difficult journey, and I thank the Holy Mother for the precious friends she sent to aid me. So many things. I wish that I had studied more, listened more, paid attention more. I had a brilliant foster mother, a great woman. She tried to teach me so much - I realise that now - but I never listened the way I should have. I didn't understand. Perhaps if I had, I would be a wiser, kinder, stronger ruler. I do not think I can ever be all that my people need me to be, all that they deserve. And for myself, I wish that I had spent more time appreciating the peace and simplicity of my former existence. Had I known all that would later occur, I would have treasured every moment of that time. How would you describe your story in less than 20 words? Foolish, headstrong girl learns who she is, fights for and against her people, falls in love, and triumphs. Do you have any funny (or embarrassing) stories about Sorin? *Bites lips* Don't tell anyone this, will you? He talks in his sleep. Sometimes just mumbling, but sometimes... oh, wonderful, silly things. Once he sang part of a very rude song. Once he called me his flame-eyed goddess. Once he caught my hand and recited half of a lover's speech from a play we had seen the day before. But he never remembers the next day. Sometimes I stay up late, just to listen to him and see what he will say. He has no idea. Don't tell him I said this! Can you tell us a secret, something that Zoë didn’t put into the book? I recently learned that Rashna - the girl I grew up with - is...well, she's Surya's daughter. That is what Deo told me. Surya was very young, and the man who had been her lover had been killed in a clash with the Sedorne, so she was all alone. She did not believe she could care for a baby - and in the midst of all the great upheaval in our country then, she felt she had a greater duty to the Rua people and to God. So she gave Rashna up to be raised by the House of God. She didn't want Rashna to know, but Rashna found out somehow. No wonder she always disliked me so much! It was as if I had taken her mother away from her. Before she died, Surya said that I was like a daughter to her... I wonder if she regretted it later, giving her true child away like that? Regretted it when it was too late? I think perhaps that is why she loved me so much. I was like her second chance. But poor Rashna. I realise now why she was so angry all the time... I would have been angry too. Only that I hear all kinds of interesting things are happening amongst my Royal Hill Guard in the Subira Mountains at the moment. Sorin's cousin is there fighting the remnants of the Sedorne army. I believe the story has been chronicled in a volume called FrostFire. Anyone who liked learning about my country from Daughter of the Flames might enjoy reading that book, too. Thanks so much for this interview, Zira! I promise I won't tell Sorin about his nightly speeches.. Ha! Curious about Daughter of the Flames? Good, because I'm giving away a copy! Just fill in the form to be entered, and that's it! You can earn extra entries, but they are in no way required to be able to win. If you haven't checked it out already, Zoë has a lovely blog called The Zoë-trope where she writes blog posts that often make me either laugh out loud or pump my first in the air and going "preach it!". Or both. You can also follow her on twitter via @ZMarriott. Birthday question: if you could only ask for ONE book for your birthday, which would it be and why?